A new series of silver coins from the Royal Canadian Mint commemorates an important milestone in the history of the nation. 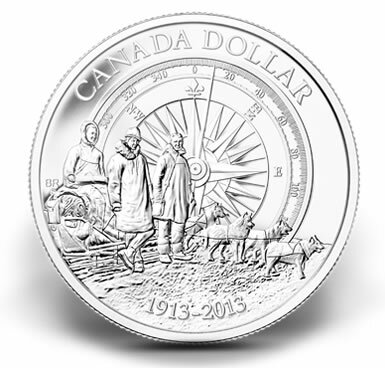 100th Anniversary of the Canadian Arctic Expedition Silver Dollars celebrate the voyage of discovery in Canada’s High Arctic. Included as part of the celebration are a proof silver dollar, a selective gold-plated silver dollar also in proof and a brilliant silver dollar. "The Canadian Arctic Expedition was one of our greatest adventures of the early 20th century and we are delighted to bring back the spirit of exploration and discovery by devoting our 2013 Proof Silver Dollar to its 100th anniversary," said Ian E. Bennett, President and CEO of the Royal Canadian Mint. These commemorative silver coins depict reverse designs emblematic of the Canadian Arctic Expedition which took place from 1913-1916. The expedition vastly expanded information related to Canada’s Northern areas. It resulted in the charting of unknown land masses, countless new specimens for scientific study and a better understanding of the people who called Canada’s High Arctic their home. 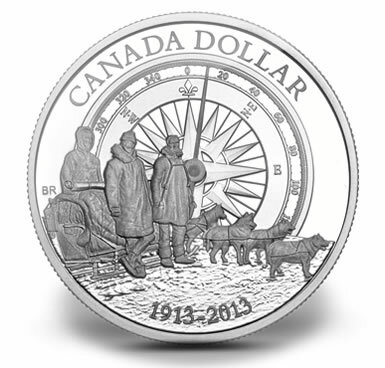 Offered as the flagship of the Mint’s 2013 collector coin program, the 100th Anniversary of the Canadian Arctic Expedition Proof Silver Dollar has a maximum mintage of 40,000. The strike appears as the 54th issue in the Royal Canadian Mint’s line of proof silver dollars. Shown on the silver coin reverse is a design by Canadian artist Bonnie Ross. Photographic documentation taken during the Arctic Expedition inspired the design. It depicts a group of three men by a sled with a team of eager canines. A stylized image of a compass serves as the skyline and horizon of the scene. These silver coins are in 99.99% pure silver and ship in a maroon flock-lined clamshell case. Pricing is CAD $59.95. The 100th Anniversary of the Canadian Arctic Expedition Brilliant Silver Dollar depicts the same reverse design as described for the above proof coin. This includes an image of three men pictured with a dog sled team. Mintage of the brilliant silver coin is 20,000. The Mint presents each encapsulated coin in a maroon flock-lined clamshell case. Pricing of the release is CAD $54.95. Included as part of the 2013 Silver Proof Set are seven different silver coins struck from 99.99% pure silver. The highlight of the set is an Arctic Expedition Proof Silver Dollar with selective gold plating. Gold-plating also appears on the $1 and $2 coins of the set. The mintage is 25,000. Pricing is CAD $229.95. 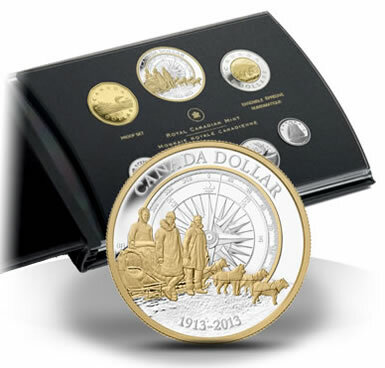 2013 Arctic Expedition Commemorative Silver Coins and the 2013 Silver Proof Set are available online at www.mint.ca or by calling 1-800-267-1871 in Canada and 1-800-268-6468 in the United States. In addition to the silver coins, the Royal Canadian Mint also offers a 2013 $100 Canadian Arctic Expedition Gold Coin for $599.95. For more information, visit the Mint’s website or read this coin news article.